Cabo Pulmo is by far the finest snorkeling and scuba diving area in Los Cabos, being home to the only living coral reef on the west coast of North America. Set midway up the East Cape of the Baja Peninsula on the Sea of Cortez, Cabo Pulmo is home to sea lions and an amazing array of tropical marine life. Your tour begins with complimentary pickup at your hotel. We'll drive up the Los Cabos corridor, through San Jose del Cabo, and beyond, until reaching the Buenavista Beach Resort, where we'll board the high-speed 15-passenger rafts for our ecological marine journey to the splendors of Cabo Pulmo. Cruise at 45 mph along the beautiful desert coastline, as your naturalist guide gives you a guided tour. Reach Cabo Pulmo, bypassing the 50 minutes of dirt road driving that all other tours to Cabo Pulmo include, and experience some of the finest snorkeling spots on the reef, and indeed the best of any on Mexico's west coast. After snorkeling, we'll return to the Buenavista Beach Resort, where we'll enjoy a delicious lunch. Cruise Passengers: This tour is available as a shore excursion if your schedule	allows. Friday, Saturday and Sunday at 9:00 AM from April through November. From December to March, you'll want to check out our Ultimate Whale Watching tour. Complimentary pickup from your hotel. Extra Money for drinks, tips, etc. Ages 5 and up. Kids prices apply to ages 5-11. This is the only tour to Cabo Pulmo to cut out about 50 minutes of driving on dusty, washboard gravel roads. Instead, you're having a fun and exciting boat ride up the coast. It makes a big difference. 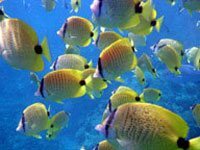 Cabo Pulmo is the best snorkeling within a day trip of Cabo San Lucas. It doesn't run during the winter months because the winds pick up during those months. Don't forget to see our other Ocean Riders tours - the 2-Beach Bonanza and the Whale Watching!